cleanliness and physical characteristics of restrooms, including interior construction, adequate supplies/odor free, adequate number of facilities, exterior appearance and location in relation to park spaces, and interior appearance. the park's setting and site layout, function and identification of signage, overall exterior building maintenance, noise, trash disposal, litter and debris around the grounds and sites, and appearance of grounds, sites and entrance area. This is one of the few parks we have been to that deserve their rating. This park is worth the price of staying. close to all the fun and to the x-way. We stayed two weeks and loved it. Staff is 1st rate and coffee and donuts every morning.. nice touch. Super clean baths and laundry. Own this Park? Comment on this review. The nicest place to stay in the area!!!! I can't stress that enough. The nicest people and very welcoming!! Very clean, Nice concrete pads, along a breathtakingly beautiful river. Located in a very nice quiet area. We are coming back next year for sure. Plenty of great places to walk the dogs. Bathrooms, spotless!!!! Every nice laundry room. It just doesn't get any better. As a woman, I felt very welcomed at morning coffee, all men. I got all the scoop of where to go and what to do. This is not a campground, as the name states Resort! See you next year! This the only place me and my wife stay when we go to Sivervelle. Well maintained sites and grounds. All sites are concrete and level,long enough for rig and tow. This is a very nice park. The Staff is very friendly and helpful. The sites are all concrete and the roads are paved. The landscaping is immaculate and the whole park is very well maintained and clean. We had a site on the river that was a pull-in with a beautiful view. I would definitely recommend the park and will stay here the next time. This is a pristine park with pull in sites facing the river for class A's and back in for others which still have river views. Each site is bordered by shrubbery and full concrete pad. Staff very helpful and friendly. Decent wifi and cable. One of the nicest parks we've stayed in. The friendliest, cleanest, nicest park! You just can't get much better than this. The staff is so nice and friendly and really make you welcome! The park is extremely clean, fantastic views. Very peaceful and serene! This was our first trip to this park, but will not be our last. 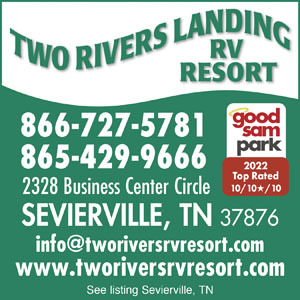 We stayed in Lot#23 riverfront and really enjoyed it. We have a 41 foot and there was plenty of room and also room to park our car on the side. It was nice to have a wide concrete area, since it rained one day and we did not have to get off the concrete. So many parks have a concrete pad, but not enough room to walk. This is a very well planned park. We loved our stay at Two Rivers Landing. The place was kept so clean. The restroom/showers was the cleanest I have ever seen. The management staff was so very sweet and helpful. Loved the doughnuts everyday. Even the laundry room was exceptionally clean. The campsite was so lovely with the overlook of the river. I will be staying there again. 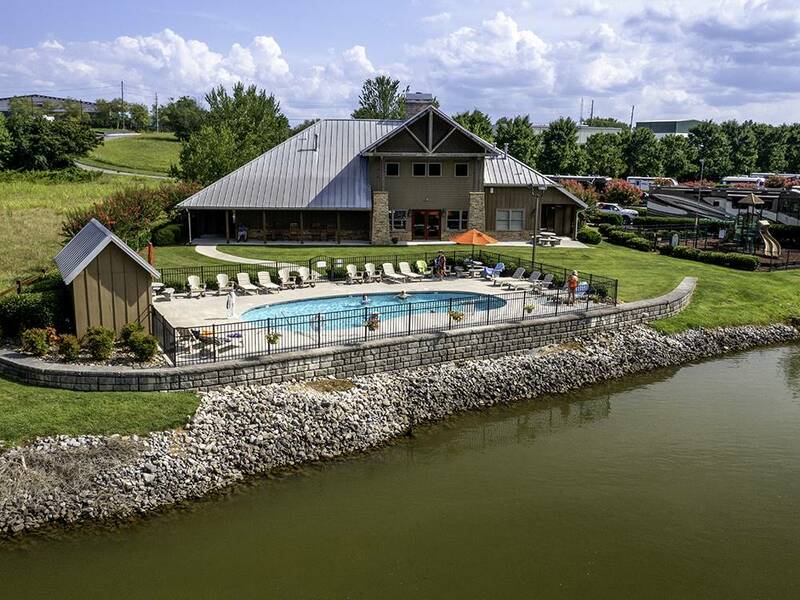 We stayed at Two Rivers Landing over the Labor Day Weekend 2015 in spot 27. The web based registration process was flawless. Upon check in everyone was very friendly and helpful. They guided us to our site and helped us back in and get positioned. The RV park (not really a campground, no tents allowed) itself was very well maintained and the landscaping was beautiful. The pads are all poured concrete, level and the hookups functioned properly. The pool was clean and in good condition. Playground for the kids was very nice. We had our "Grand Dog" with us and there is a nice dog walking area in the campground and a large field across the way that was closer to us. The only thing we missed a bit was a camp fire ring. The restrooms & showers were really great. Better than many hotels I've stayed in. We'll definitely be back. Information, views and opinions expressed on this website are the views of the person posting the message, do not reflect the views of Good Sam, and are not endorsed, supported, encouraged, sanctioned, verified or agreed upon by Good Sam.